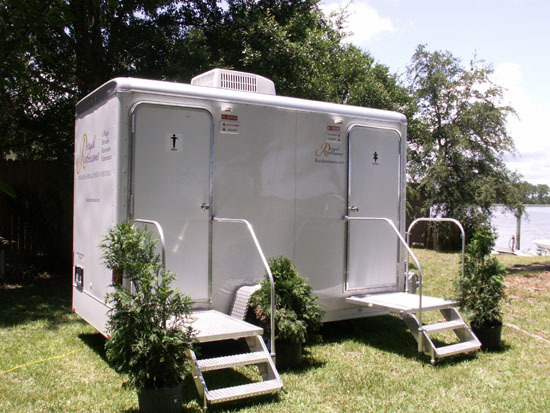 Royal Restrooms was born as the result of a porta potty accident that happened back in 2004. David Saurers, a commercial banker from Savannah Georgia was at a local festival with his infant son and his daughter who was potty training at the time. While Saurers had the pure and fatherly intentions of exposing his children to new experiences, events would unfold that were far from what he envisioned for the afternoon. After a while of enjoying the festivities Saurers daughter needed to go to the bathroom. Once she alerted her father he located the nearest porta potty and realized that he had to go into the porta potty with his daughter due to the fact that she was potty training. This also meant that he had to bring along his infant son. Needless to say the porta potty was not built to accommodate more than one person and the attempt to navigate the situation as a trio led to both David and his young daughter being soiled and a stranger who came to their aide holding his son. This aggravating experience led to Saurers deeming the present standard for outdoor bathrooms at the time as unacceptable and set out to improve the industry standard. He not only want to create a more comfortable experience, he wanted to create an experience that was more sanitary as well. David decided to partner up with his engineer friend Robert Glisson in order to create a satisfactory and marketable solution to outdoor restrooms deplorable state at the time. Both men ended up leaving their successful careers that they spent their lifetimes building and founded Royal Restrooms of Arizona. Royal restrooms has been providing top of the line outdoor restroom facilities for weddings, emergency and disaster relief, business remodels, festivals and other outdoor events in Phoenix, Tempe, Scottsdale, Glendale, Mesa, Chandler, Ahwatukee, Gilbert, Tucson and many other cities throughout Arizona. Upgrade the experience of your event, contact Royal Restrooms today!